These free necklace projects should spark your inspiration! 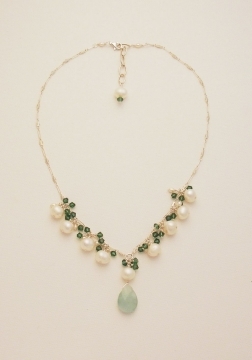 Necklace projects are a great way to use your jewelry making skills. Imagine creating a unique handcrafted necklace set, or a special pendant or choker to match your outfit! How about making your own wedding jewelry? Here are several free step-by-step necklace projects to have you making your own great necklaces in no time. 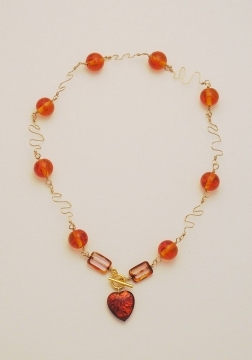 I've included several free necklace projects, below, including a briolette bead necklace, a turquoise necklace, a lariat necklace, a beautiful Swarovski crystal and pearl necklace, and a lampwork bead necklace. Learn how to make all of these great designs, with easy free step-by-step jewelry making instructions and my tips to make it fun and easy for you to make your own necklaces and pendants. 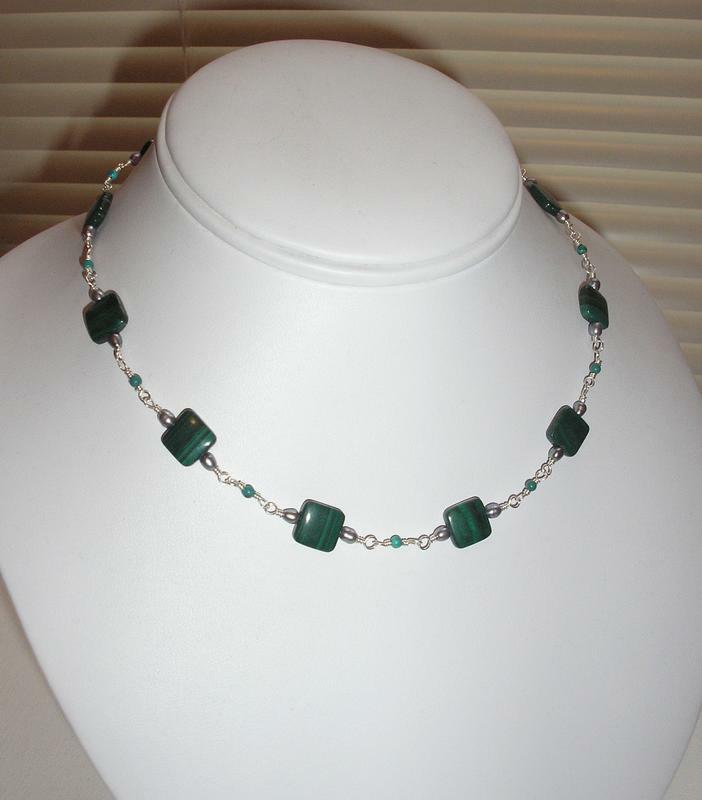 Malachite Bead Necklace - Gorgeous green malachite beads are the focal point in this beaded chain necklace. 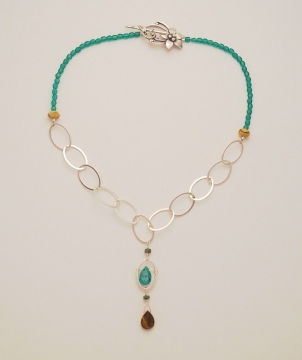 Accented with seed pearls and turquoise. Sodalite Toggle Necklace - Pretty blue sodalite beads in a simple strand with a front-facing toggle clasp and accent beads. 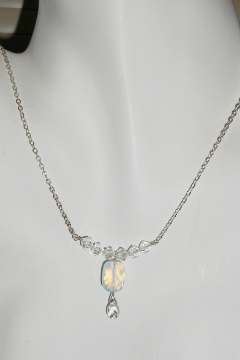 "Moonglow" Opalite Pendant - pretty opalite pendant off-set with sparkling crystals in a delicate design. 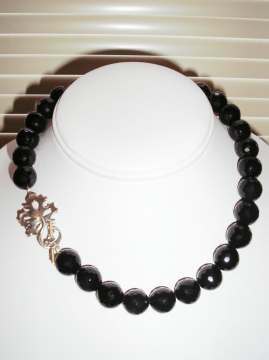 "Midnight" Black Onyx Necklace - A simple strand of jet black beads with a gorgeous clasp makes a quick and easy, yet stunning design. "Victoriana" - Vintage Filigree Pendant - Quick and easy design! 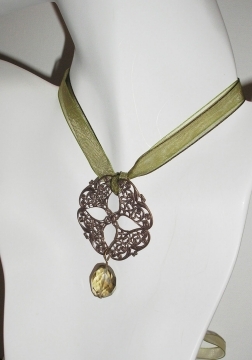 A vintage-look brass finding strung onto organza ribbon makes a simply beautiful pendant. 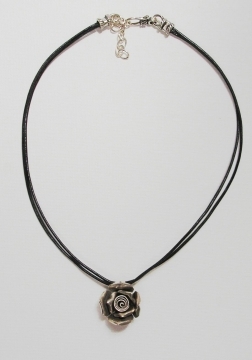 Hill Tribe Silver Pendant - A pretty silver rose pendant is strung on leather cord in this easy to make necklace. Shell Bead Pendant with Pearl Drops - A fabulous organic design of mother of pearl shell donut beads, and wire wrapping, with dancing pearl drops! 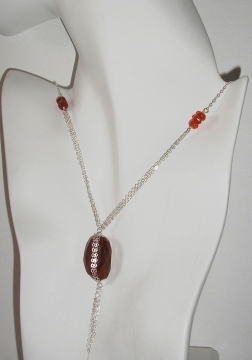 Carnelian Nugget and Chain Necklace - A carnelian nugget bead is showcased in sterling silver draping chain. Metal Mesh Necklace with pearls - Charcoal gray pearls are contained inside this delicate wire mesh, with tiny crystals sparkling throughout. Unique! Turquoise Jasper Pendant - A gorgeous and unique pendant with turquoise beads and aqua blue chalcedony briolette drop detail on a turquoise jasper oval stone. 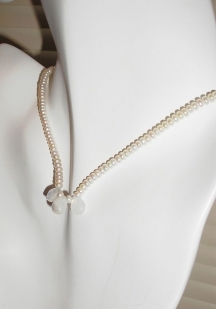 Moonstone and Pearls Necklace - Freshwater button pearls with three simply perfect moonstone beads. 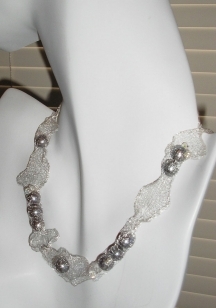 Pink Pearl and Crystal Choker - This classic design is perfect for wedding jewelry. 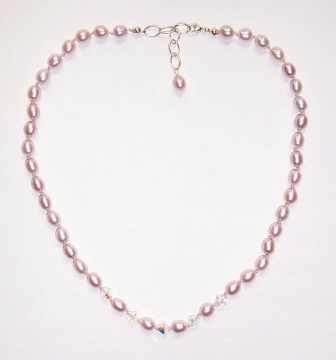 Pink freshwater pearls are hand-knotted on silk thread, with sparkling Swarovski crystal details. 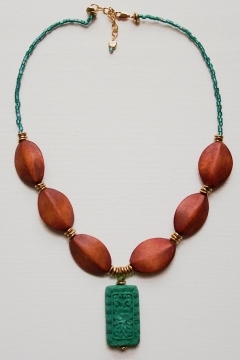 Turquoise Heishi and Wood Bead Necklace - This simple design is great for summer. 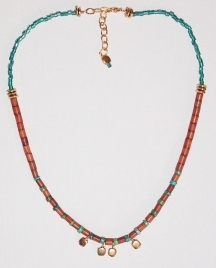 Features wood beads, turquoise heishi beads, and gold "chiclets". 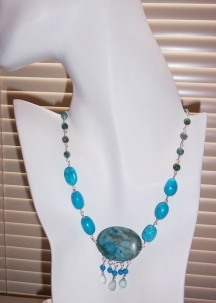 Turquoise and Wood Pendant - This pendant features a carved turquoise colored focal bead and big wood oval beads. Funky and fun! 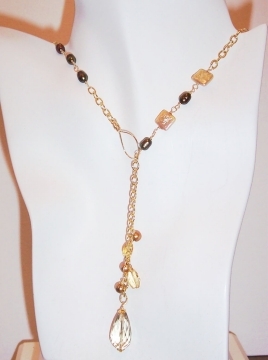 Lemon Quartz Lariat - This fabulous lariat is made with a handcrafted wire toggle with a lemon quartz drop, citrines, and gold and green pearls attached to gold chain. Wow! Link Chain Briolette Necklace - uses the contemporary new large oval link chain with briolette beads. Make this unique, handcrafted necklace set.